Oil painting: The Temptation of St Anthony by Jan van der Venne, oil on panel. 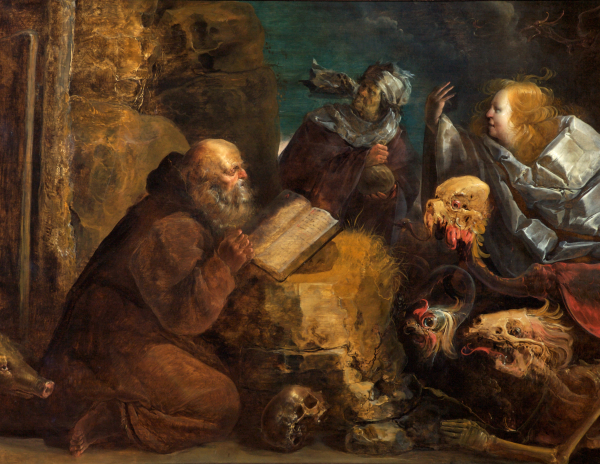 Jan van der Venne of Brussels shows the hermit saint Anthony visited by violent temptations. A blonde wrapped in soft satin beckons to him, while Avarice rattles a bulging purse. He is taunted by visionary demons: one has a skull bobbing on a snake-like neck, with a second head dripping from its nose. The artist contrasts the swirling movement of the fiends with the rock-like silence of St Anthony kneeling in prayer.